This is our review of the Executive Lounge at Cardiff Airport. 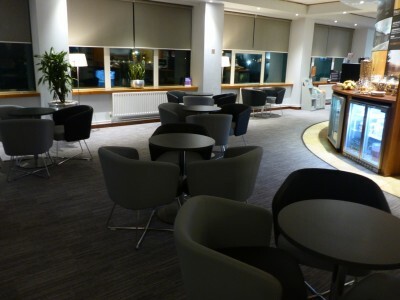 This is part of our series of reviews of airport lounges across the UK. You see all of the reviews here. 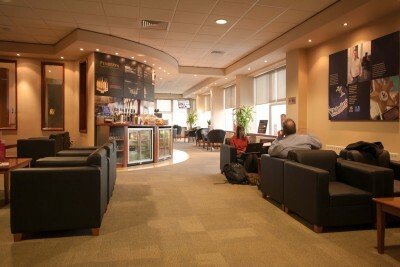 “The Executive Lounge at Cardiff Airport is located just off the main seating area tucked away in the left hand corner through double doors. The opening hours are 05:00 – 21:00 daily (except for Saturdays Nov-May when the closing time is 17:00). The lounge has one area to the left and another to the right. On the left side is an area with small tables and chairs. 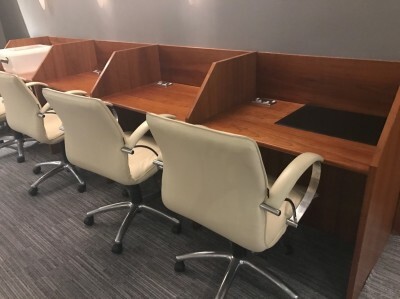 If you want to do some work you can use one of the little desks. There are plenty of plug sockets available for use and free Wi-Fi. 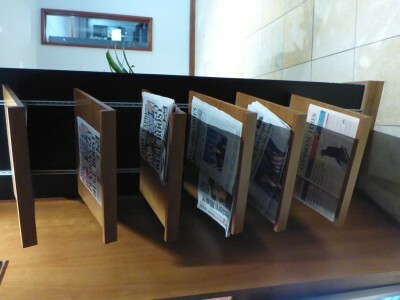 There is a selection of newspapers and magazines. 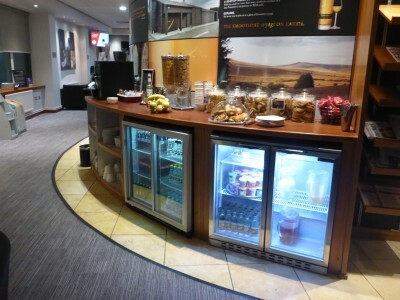 Both areas join to their own snack bars that have a good selection of nibbles: pastries, crisps, cereal, fruit, yoghurt and cakes. The rocky road and Welsh cakes are excellent. Note that the food is the same at all times of the day so don’t expect anything special at breakfast or early evening. The coffee machine and soft drinks fridges are also here. 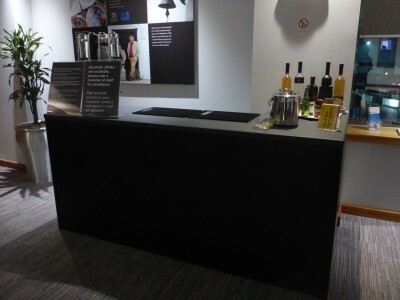 The alcoholic drinks have recently changed to bar service and the bar is in the area with the tables. The service has been prompt during the visits I have made since it changed from self-service. The selection is good and features the normal range of spirits but I particularly like its selection of spirits from the Penderyn distillery in the Brecon Beacons. I am partial to the single malt and my wife loves the Merlyn (a Baileys-type drink). There is also a selection of wines and locally sourced Glamorgan beers. Entry can be gained with either a Lounge Club card (comes with American Express Gold, two free entries included) or a Priority Pass card (comes with American Express Platinum, unlimited free entries). You can also pay on the door or book in advance. Though the lounge is small by comparison to some reviewed on HFP lately, it has never been busy when I have been there. When I was there at 6pm on a Friday there was only one other person in the lounge. This is likely due to how quiet Cardiff airport is in general. I like the theming within the lounge with some Welsh history and a lot of large advertisements for the Penderyn distillery – although this is personal taste. The staff are very friendly. There are toilets attached to the lounge so you do not have to go back to the main concourse. They could, to be honest, do with a bit of a face lift. There are flight information screens within the lounge. The dress code is smart casual. I have been to the lounge in tailored shorts and a t-shirt many times and never had any problems. I have also been in as a group the staff have been happy to keep serving us despite having more than the two drinks they recommend. Thanks Nathan. If you want to pre-book paid access to the lounge, you can do so via the Lounge Pass website here. Maximum of 2 drinks limit in Cardiff lounge. Not sure how much they enforce it though. Never inforced it when I have been there. As an ex-Cardiff resident who now has LHR as their local airport I’ve got to admit to sometimes (not that often though!) missing CWL. This lounge actually looks vaguely decent and the terminal wasn’t bad the last time (2011 – time flies!) I flew out of there. The shame is unless you’re flying to AMS or DUB, there’s not a huge amount of flights from CWL these days with most people making the trek across the Severn Bridge to BRS. I wonder what the future will be for it as an airport. We have a few new routes to Spain through Vueling as well as Iberia other budget airline to Madrid. When we got a route to Amsterdam, it opens up the world. Cheaper taxes as well. I’ve found the executive lounge staff very friendly and the facilities more than adequate. I have to challenge the lack of routes. 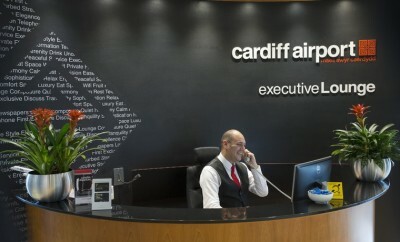 In 2016 Cardiff Airport was the fastest growing UK airport and Flybe now has an extensive network to many European Cities, Paris, Berlin, Munich, Dusseldorf, Milan, Rome, not forgetting a twice daily connection to London City Airport and the network appears to be continually growing. Summer 2017 sees the introduction of twice weekly Madrid flights with Iberia Express (New to Cardiff) and Vueling continues to expand with a 5 x weekly connection to Barcelona, an exciting hub with many International connections. (Not forgetting Alicante, Malaga year round and Palma in the Summer) Admittedly quieter in the Winter, but easier to get around, there is an explosion of holiday flights in the Summer. Winter 16/17 saw cruise flights to Dubai and Bridgetown, so Cardiff is definitely worth keeping an eye on !!. Looks like Flybe have taken off somewhat down there. Not flown from CWL for a long time personally (see 2011 comment above) so it’s good that things are improving. Will it be enough though? Most people I know (friends, family etc) who still live down that way tend to go to BRS for all their flights. Now its owned by Welsh Government it has picked up. Pity we cant get RyanAir or Easyjet to move to Cardiff & make it a proper rivalry. I guess that wont happen unless the Severn Bridge is free. As it is, Bristol is in a much better catchment area. As a National Airport, part of Cardiff’s problem is APD, with no level playing field between Scotland and Northern Ireland who have reduced APD….Suppose it helps if you have a Cabinet Minister that actually ‘fights your corner’ ! http://flycardiff.blogspot.co.uk/2017/02/cairns-and-his-cojones-in-vice-like.html There is huge potential for International flights for which Cardiff has not only the runway capable of taking large aircraft (as opposed to BRS) and the capacity. Thanks for the review. You can also get in with Lounge Key (I know some readers have it).